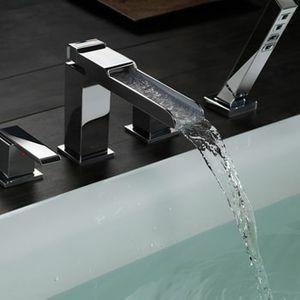 There are many different types of both traditional and modern bathroom faucets that we carry here at PlumbersStock. 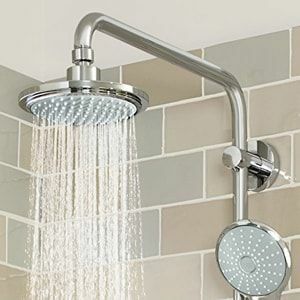 Save on tub, shower, and lavatory sink faucets, as well as the rough plumbing that must be installed along with your fixtures. When purchasing your lavatory faucet, the first consideration should be which style you want to buy. There is a tremendous variety available, from classic to handle to modern and unique designs. 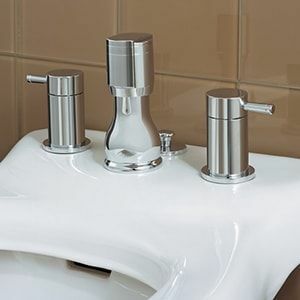 Faucets come in both center-set faucets, fitting the standard three-hole sink, and single-hole faucets. These can have a single lever function or automatic turn-on functionality. These are a better choice if you have a smaller sink as it will take up less of your sink space. 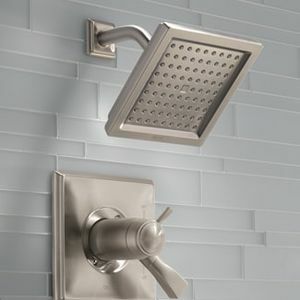 You may also want to consider a wall-mount bathroom faucet, freeing up more sink space and eliminating grime build up that often accompanies standard sink mounts. When choosing the finish, there are many choices to choose from, making it easy to match almost any bathroom decor. 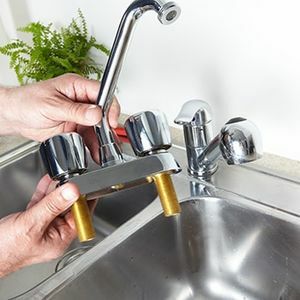 It is good to look for PVD coatings, which helps to shield the faucet from corrosion. There are a few important features which you may want to include in your decision. Anti-scald protection is particular important if you have small children or elderly in the home. This technology allows you to set a limit to how hot the water can get. Filtering may be a smart choice if the water in your area has a lot of lead, chlorine, or other contaminants. PlumbersStock offers a huge inventory of modern bathroom faucets so please browse our products or contact a professional on our customer service staff. A big point of confusion when it comes to bathroom faucet replacements is that many don't realize that a trim kit is not a shower kit. A trim kit is just the part that goes on the outside of the faucet (the spout and handle). 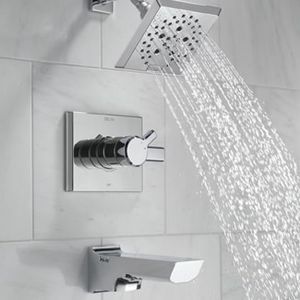 A full shower kit includes both the trim kit and the valve that is behind the scenes. Some kits even include light fixtures and towel racks to complete and coordinate your bathroom design. There is a wide variety of shower kits, bound to fit any need that you may have. You will want to choose a design that fits your artistic ideals and offers easy maintenance. Shower kits come in framed and frameless varieties, corner fits, round fits, and neo-angle (five-sided diamond shape). Whatever your need in a discount bathroom faucet, PlumbersStock helps you find just the right fit. There are many different styles of tub faucets here at PlumbersStock, guaranteeing you that we have the perfect choice for your style. The most classic option for tubs that double as showers is a wall mount, installed with three holes drilled into the inside of the tub. Rim mount faucets are installed in the same fashion, but the holes are drilled on the rim of the tub. Freestanding faucets can be placed anywhere around the tub, it is mounted to the floor, and then secured to either to tub or wall. These are a great option for tubs without holes. 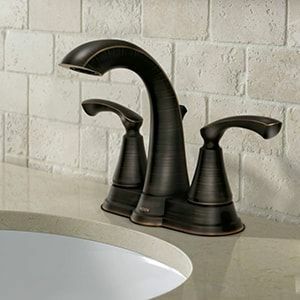 Make sure you get all the best bathroom accessories to go along with your new faucet.